Heat a dutch oven, or large heavy-bottom pot, to medium-high heat, and brown the bacon until crisp, and set aside, while reserving drippings. Add the venison burger and brown in drippings, and when it’s about ¾ the way cooked through, add the onions and saute just until translucent. Add the garlic and sauté for 30 seconds. Add the remaining ingredients, except the bacon and fresh cilantro, and bring to a boil, then reduce the heat to a simmer, and cook, covered, while occasionally stirring for 50 minutes. 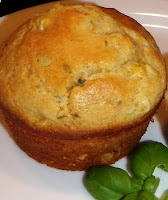 Meanwhile, begin preparing the Premium Cornbread Muffins about 20 minutes before Venison Tex-Mex Chili is scheduled to be done, if making...(as they take about 15 minutes to bake). After the Venison Tex-Mex Chili has cooked for 50 minutes, stir in the fresh cilantro, and crispy bacon. To serve, ladle the Venison Tex-Mex Chili into soup mugs placed in the center of a plate, and place Premium Cornbread Muffins around parameter. 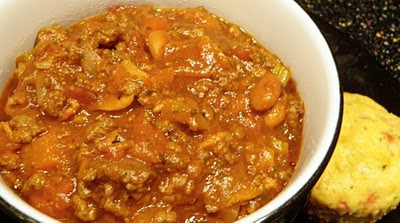 (Top the Venison Tex-Mex Chili with shredded cheddar cheese and sliced pickled jalapenos, if using). - Enjoy! Tip: This is just as fantastic using any other type of lean ground meat or poultry as well!